On February 8 and 9, the Sailing Living Lab laboratory which tests new navigation technologies, will be explained by the crew of the sailing boat Acrobat which is anchored at Marina La Palma. The crew will offer a series of lectures and a visit on board. The sailing boat and its crew sail around the world with the latest technologies on board, testing them on the high seas under the toughest conditions. 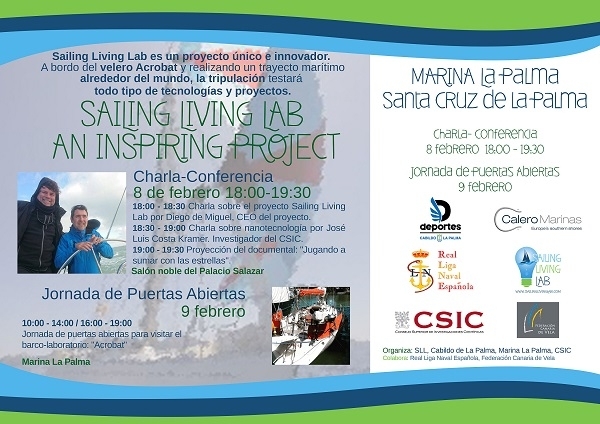 08.02.2019 - Today, February 8, will see three informative lectures starting at 6pm in the Island Council Cultural Hall in Calle Real in Santa Cruz de La Palma: Diego de Miguel will present the Sailing Living Lab project and its philosophy. José Luis Costa Kramer will talk about nanotechnology and a documentary film about navigation with orientation on the stars will be shown. On Saturday, February 9, the boat can be visited at the Marina. The opening hours are from 10am to 2pm and 4pm to 7pm. Produced with news.CMS in 0,0934 seconds.